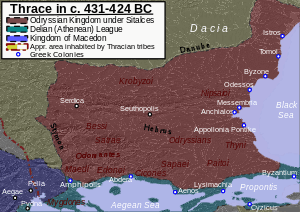 Herodotus called the Getae "the noblest as well as the most just of all the Thracian tribes." 106 AD, Dacia becomes a province of the Roman Empire conquered by Trajan. ↑ Carlos Parada, "Orpheus, king of the Ciconians"
↑ Tereus, "Tereus 1 is the cruel Thracian king who helped King Pandion 2 of Athens in his war against King Labdacus 1 of Thebes, and having received one of his daughters seduced the other"
↑ Phineus, "Phineus is the blind king and seer"
↑ Poltys, "Poltys. An Aenian who entertained Heracles when he came to Aenus in Thrace. He was son of Poseidon [Apd.2.5.9]." ↑ Harpalyce(Ἁρπαλύκη)., "1. A daughter of Harpalycus, king of the Amymnaeans in Thrace. As she lost her mother in her infancy, she was brought up by her father with the milk of cows and mares, and was trained in all manly exercises. After the death of her father, whom she had once delivered from the hand of the Myrmidons, she spent her time in the forests as a robber, being so swift in running that horses were unable to overtake her. At length, however, she was caught in a snare by shepherds, who killed her. (Serv. ad Virg. Aen. 1.321; Hyg. Fab. 193.)" ↑ Peiros, Peiros. 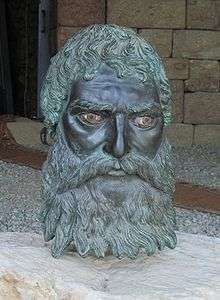 Thracian leader, son of Imbrasus and father of Rhigmus. He was killed by Thoas 2, Leader of the Aetolians (Hom.Il.4.520ff., 20.484ff.). ↑ Rhesus Rhesus 2 is chiefly remembered because he came from Thrace to defend Troy with great pomp and circumstance, but died on the night of his arrival, without ever engaging in battle. ↑ Polymestor, "Polymestor 1 (Polymnestor). This is the king of the Bistonians in Thrace"
↑ Carnabon, "Carnabon. King of the Getae in Thrace who came into power when grain was first given to men [see also Lyncus, and CONSTELLATIONS] [Hyg.Ast.2.14]." ↑ Dacia: Landscape, Colonization and Romanization by Ioana A Oltean, 2007, page 41: "... Trixae and Sophocles (Triptolem, FR 547) mentions a local king, Charnabon, as a typical anti-hero." ↑ The Oxford Classical Dictionary by Simon Hornblower and Antony Spawforth, ISBN 0-19-860641-9, page 1515, "The Thracians were subdued by the Persians by 516"
↑ The Histories by Herodotus, John M. Marincola, and Aubery de Selincourt, page 373: "... 500 mercenaries, and married Hegesipyle, daughter of the Thracian King Olorus." ↑ Plutarch's Lives by Plutarch, 2008, ISBN 1-4404-1432-7, page 183: "... Danube, and by winning a signal victory over Syrmus, the King of the Triballi. After this, as he heard that the Thebans had revolted, ..."
↑ The Oxford Classical Dictionary by Simon Hornblower and Antony Spawforth, 2003, page 1515: "... *Calpurnius Piso Caesoninus, and *Cicero calls Rabocentus, chief of the Bessi, a faithful ally, although hitherto they had been troublesome ..."
↑ Polyaenus: Stratagems - BOOK 7 ,The generals of the Cebrenii and Sycaeboae, two Thracian tribes, were chosen from among the priests of Hera. Cosingas, according to the tradition of the country, was elected to be their priest and general; but the army took some objection to him, and refused to obey him. To suppress the rebelliousness that had taken hold of the troops, Cosingas built a number of long ladders, and fastened them one to another. He then put out a report, that he had decided to climb up to heaven, in order to inform Hera of the disobedience of the Thracians. The Thracians, who are notoriously stupid and ridiculous, were terrified by the idea of their general's intended journey, and the resulting wrath of heaven. They implored him not to carry out his plan, and they promised with an oath to obey all of his future commands. ↑ Ancient Coins of Greek Cities and Kings: From Various Collections Principally in Great Britain by James Millingen, 2004, page 42: "... silver mines so renowned in history. A coin of Geta, king of the Edones, with the legend FETAI HAONEON BAIIAEYI of the same types, ..."
↑ Atlas of Classical History by R. Talbert, 1989, page 63, "Getae under Cothelas"
↑ Kurt W. Treptow and Ioan Bolovan in “A history of Romania - East European Monographs”, 1996, ISBN 9780880333450, page 17 "..Two inscriptions discovered at Histria indicate that Geto-Dacian rulers (Zalmodegikos and later Rhemaxos) continued to exercise control over that city-state around 200 BC ...."
↑ Kurt W. Treptow and Ioan Bolovan in “A history of Romania - East European Monographs”, 1996, ISBN 9780880333450, page 17 "Two inscriptions discovered at Histria indicate that Geto-Dacian rulers (Zalmodegikos and later Rhemaxos) continued to exercise control over that city-state around 200 BC ...."
↑ Dacia: Landscape, Colonization and Romanization by Ioana A Oltean, 2007, page 53, "Dacian King Oroles"
↑ Dacia: Landscape, Colonization and Romanization by Ioana A Oltean, 2007, page 47, "Dicomes of the Getians"
↑ The Roman History: The Reign of Augustus by Cassius Dio, Ian Scott-Kilvert, and John Carter, 1987, page 85: "... Then he completed their destruction with the help of Roles, the king of a tribe of the Getae. When Roles visited Octavian, he was treated as a friend ..."
↑ Cassius Dio. Roman History, Book LI. "While he was thus engaged, Roles, who had become embroiled with Dapyx, himself also king of a tribe of the Getae, sent for him. Crassus went to his aid, and by hurling the horse of his opponents back upon their infantry he so thoroughly terrified the latter also that what followed was no longer a battle but a great slaughter of fleeing men of both arms. Next he cut off Dapyx, who had taken refuge in a fort, and besieged him. In the course of the siege someone hailed him from the walls in Greek, obtained a conference with him, and arranged to betray the place. The barbarians, thus captured, turned upon one another, and Dapyx was killed along with many others. His brother, however, Crassus took alive, and not only did him no harm but actually released him." 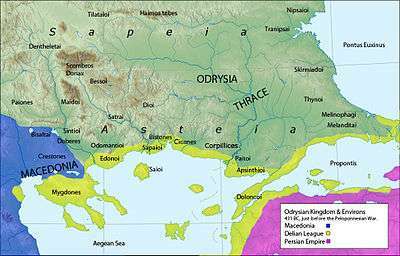 ↑ Dacia: Landscape, Colonization and Romanization by Ioana A Oltean, 2007, page 48, "The Dacian king Cotiso"
↑ Dacia: Landscape, Colonization and Romanization by Ioana A Oltean, 2007, page 146, "Zyraxes who ruled in Dobruja"
↑ Studies in Ancient Greek and Roman Society by Robin Osborne, 2004, page 128: "... of its citizens, named Akornion, went on an embassy to Burebista, the first and greatest of the kings in Thrace..."
↑ Dacia: Landscape, Colonization and Romanization by Ioana A Oltean, 2007, Index (Decaeneus/Dekaineus/Dicineus) Dacian High priest"
1 2 Dacia: Landscape, Colonization and Romanization by Ioana A Oltean, 2007, page 72, "At least two of his successors Comosicus and Scorillo/Corilus/Scoriscus became high priests and eventually Dacian kings"
1 2 Dacia: Landscape, Colonization and Romanization by Ioana A Oltean, 2007, page 47, "Kings Coson (who minted his own coins) and Duras"
↑ De Imperatoribus Romanis . Retrieved 2007-11-08. "In the year 88, the Romans resumed the offensive. The Roman troops were now led by the general Tettius Iulianus. The battle took place again at Tapae but this time the Romans defeated the Dacians. For fear of falling into a trap, Iulianus abandoned his plans of conquering Sarmizegetuza and, at the same time, Decebalus asked for peace. At first, Domitian refused this request, but after he was defeated in a war in Pannonia against the Marcomanni (a Germanic tribe), the emperor was obliged to accept the peace." ↑ Wilhelm Tomachek in “Les restes de la langue dace” published in “Le Muséon By Société des lettres et des sciences, Louvain, Belgium, page 407 "Pieporus, prince des daces Costoboces..."
↑ Gudmund Schütte in Ptolemy's maps of northern Europe, H. Hagerup, 1917 page 82 "historical king Pieporus. The same author Schütte in “Our forefathers” published by University Press, 1929 page 74 "The North Dacian tribes of the Koistobokoi and Karpoi unlike the rest of Dacia escaped the Roman conquest of AD 105..."
↑ Berciu 1981, p. 139-140. ↑ Strabo,Geography(7.5.2), "A part of this country was laid waste by the Dacians when they subdued the Boii and Taurisci, Celtic tribes under the rule of Critasirus"
↑ Celts and the Classical World by David Rankin, ISBN 0-415-15090-6, 1996, page 189: "... and destroyed it. According to Polybius, the last of the kings of Tylis, Cavarus, was a man of magnanimity and regal character (8.24). ..."
↑ The Ancient Celts by Barry Cunliffe, ISBN 0-14-025422-6, 2000, page 86: "... distinguished suggests that one of the returning groups, led by Bathanatos, finally settled in the Middle Danube region at the confluence ..."
↑ Celts - a History, The by Daithi O HOgain, ISBN 1-905172-20-6, 2006, page 60, "... those who, on their return from Greece under their leader Bathanatos, had settled at the confluence of the Danube and the ..."
↑ Heckel, Waldemar. Who's Who in the Age of Alexander the Great: Prosopography of Alexander's Empire. Blackwell Publishing, 2006, ISBN 1-4051-1210-7, p. 155. "In 306 or 305, he assumed the title of "King", which he held until his death at Corupedium in 282/1." 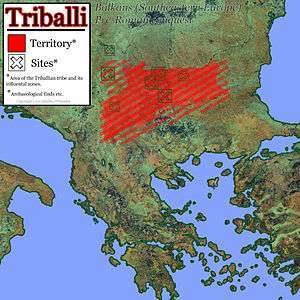 ↑ The Thracians 700 BC-AD 46 by Christopher Webber, ISBN 1-84176-329-2, 2001, page 11, "Philip V of Macedon occupied all the cities in Thrace up to the Hellespont, "
↑ Thrace. The History Files. ↑ Readings in Greek History: Sources and Interpretations by D. Brendan Nagle and Stanley M. Burstein, ISBN 0-19-517825-4, 2006, page 26: "... Ariapeithes, the Scythian king, had several sons, among them, ... by Spargapeithes, king of the Agathyrsi; whereupon Scylas succeeded to the throne, and married one of ..."
↑ Thracian Kings, University of Michigan, "On the death of the last Astaean king in 11 BC, the emperor Augustus conferred all Thrace to his Sapaean uncle Roimētalkēs I. In 46, on the murder of Roimētalkēs III by his wife, the kingdom of Thrace was annexed to the Roman Empire by the emperor Claudius I." The Histories, translated by G. C. Macaulay, Barnes & Noble, Inc., 2004.